The Timberwolf TW 230 VTR variable tracked 35hp 6" chipper pulls no punches, whether its tracking to site or clearing site, the machine is ruthlessly efficient at getting the job done. 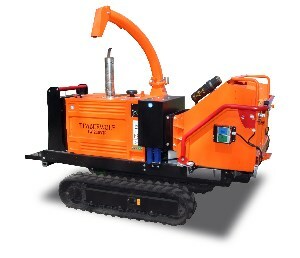 Using the latest computer modelling Timberwolf have taken the opportunity to design in more strength, more performance, better ergonomics with simpler maintenance and service schedules, making the all new Timberwolf TW 230VTR, bigger, stronger and faster than anything else available. Add to this performance the competitive price and you have an all-round chipper that will work hard for your business year after year making the TW 230VTR a wise investment for your business.